The card instantly brings to mind powerhouses such as Survival of the Fittest and Birthing Pod. 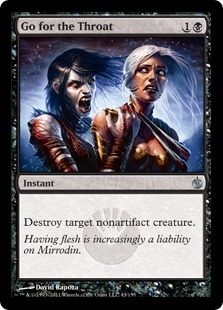 However, unlike those cards you don't get a tutoring effect and you are sacrificing creatures on the board for cards in hand - whereas Survival allows you to discard creatures from hand to tutor a creature into your hand and Pod allows you to sacrifice a creature to put another straight into play. The value you can get from the card is still considerable though, particularly if you are able to respond to removal spells or get further value out of making the sacrifice. 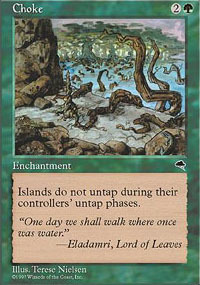 The problem I have found with Evolutionary Leap is that it is very mana hungry. Getting creatures in your hand is great but you also want to cast them and then you ideally want to have the mana to activate Leap again if necessary. I'm not entirely sure what the best solution is but let's discuss the current build I am working with. A while back I wrote about a BG Zombies deck in this article series and that seemed like a good fit for Evolutionary Leap. Creatures like Gravecrawler, Bloodghast and Geralf's Messenger work really well with Leap as recurring creatures allowing you to put multiple extra creatures in hand. 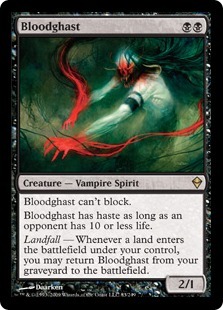 Gravecrawler and Bloodghast and fairly easily brought back to the battlefield and so are great creatures to pitch to Leap. 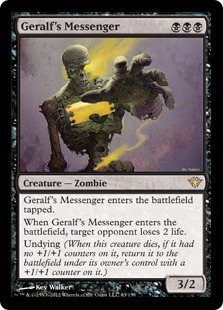 Geralf's Messenger drains your opponent's life when it comes in and when it returns with Undying, making it a nice creatures to find off of Leap and a good one to sacrifice to it. This is perhaps a slightly controversial inclusion but one I ended up making and have been somewhat happy with. As I've mentioned I found Evolutionary Leap to be a mana hungry card and having a creature that can help us cast our other creatures more quickly and keep up a Leap activation is useful. On the negative side, BOP doesn't really advance our strategy as it isn't aggressive. 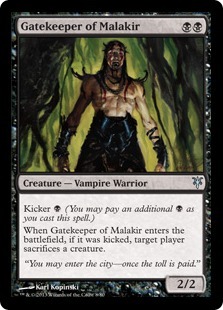 Noble Hierarch would be my preferred option but the fact it doesn't make Black mana poses a problem. I like BOP but could be convinced to cut it and I wouldn't mind cutting at least 1 as some games it's more useful than others. Particularly if you have a Gravecrawler for Turn 1. 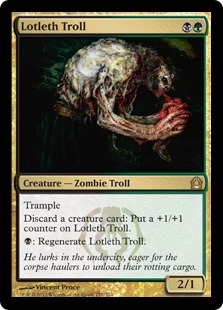 Another thing I liked about the deck was Lotleth Troll. As I've already mentioned, sometimes you are in a position where you have put a bunch of creatures into your hand but you don't have the mana to cast them. In such a situation you can pitch them to the Troll to make a larger Trampling beater. This is actually one of my favourite interactions in this deck. 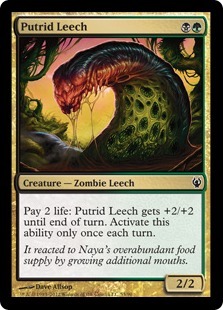 Putrid Leech isn't a creature I'm particularly fond of in the deck but we need to run a decent Zombie count in order to be able to recast Gravecrawler from the yard with consistency. At its best though, Leech is a fast beater. The main problem is that in a world where Lightning Bolt is rife you can rarely afford to use its +2/+2 ability aggressively like you would want to. Currently I am only running 1 in the deck as a test. It's a little expensive for what it does but I like the idea of taking the deck into a more Delve focused direction. It's hard to cast a quick Gurmag Angler in the deck as it stands and Wayfinder could be a way to achieve this as well as put Bloodghasts and Gravecrawlers into the yard. The fact it finds you a land is also positive as the deck, as I've mentioned, is fairly mana hungry. If it were a Zombie I think I would be running these. Gatekeeper was in the original list and I thought I would keep one in to try it out. Obviously finding it with Evolutionary Leap is quite nice, however, obviously we have no control over when we will achieve this. Silver bullets were a very strong element of Birthing Pod decks but they don't work nearly as well in an Evolutionary Leap deck. I decided to run Angler as a top end Zombie threat. However, it's actually quite difficult to cast in the deck as we aren't really milling ourselves or throwing a lot of stuff into our yard, except fetchlands. 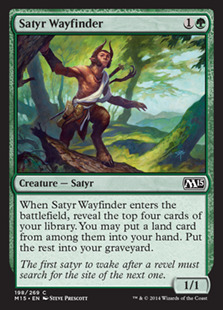 As I've mentioned I did wonder whether it would be worth putting more cards like Wayfinder in the deck to make casting Angler more consistent and hopefully mill other useful stuff into the yard, such as Bloodghasts and Gravecrawlers. The deck certainly needs a bit of tweaking in this regard. One of the most powerful removal spells in the format. A 2-mana uncounterable answer to many of the formats biggest threats is hard to pass up when you are in the relevant colours. Provides an excellent answer to so many potential problems. Pulse is an answer to most non-land permanents and versatile removal spell. It's also excellent against tokens or if you can get any multiple permanents. 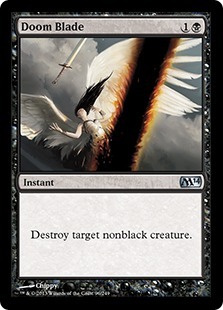 The manabase is fairly simple but slightly awkward as we need as much black mana as possible in order to cast Geralf's Messenger and Bloodghast but also sufficient green mana to activate Evolutionary Leap. As such, I run a number of fetches, Woodland Cemetery, a playset of Overgrown Tombs and a lone Urborg, Tomb of Yawgmoth. A lone Forest is in the manabase as well to avoid us getting punished by Blood Moon. Fulminator Mage seemed like a solid choice for the deck. 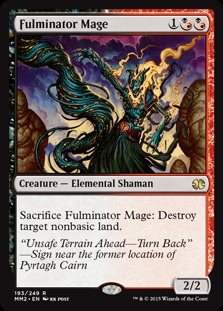 The double black mana requirement isn't difficult and a creature than can destroy non-basics is very useful. We can also find more copies using Evolutionary Leap. I could probably have done with more interesting creatures in the board. 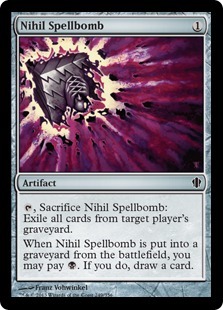 Nihil Spellbomb is graveyard hate. I was running Relic for a bit, which is more useful in slowing Delve-based decks but this makes more sense as we don't want to empty our graveyard. 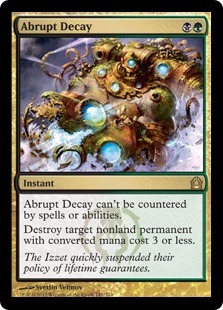 Scavenging Ooze actually might be a superior pick for graveyard hate though and could fit in the main deck potentially as a way to use our sacrificed creatures. Choke is a powerful anti-Control card and can be seriously debilitating for blue decks. Doom Blade and Go for the Throat provide additional removal for the deck for when we need it. 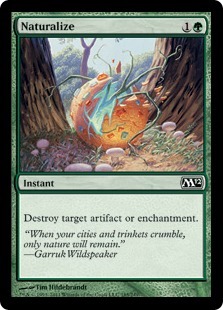 Naturalize is a nice answer to a number of different problems being able to destroy problem artifacts and enchantments. Thoughtseize and Inquisition of Kozilek are powerful hand disruption spells. Great against combo and can disrupt a number of strategies. First up I have a quick video deck tech. Here I just quickly discuss the cards and some thoughts about the deck. Please note I missed out Thoughtseize and Inquisition of Kozilek in the sideboard. Our first matchup is against RG Tron. This matchup showed some highlights and lowlights of the deck. As its best we can get some fairly aggressive draws. A Gurmag Angler and a Putrid Leech can deal a lot of fast damage. Game 3 ends badly with a Turn 3 Wurmcoil Engine proving too much to handle. Our second matchup is against an Affinity brew. I don't think my opponent was the most experienced pilot but the deck still proved too much for us. 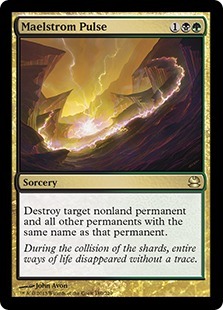 We could shore up this match with a more anti-artifact sideboard though. Our third matchup is against UW Control deck. Our opponent was running an interesting brew using the new Jace and Gifts Ungiven. Our opponent's deck was quite resilient but we were able to be aggressive enough to fight through. I liked how the deck was able to fight through an Elesh Norn, Grand Cenobite with Leap provided with a way to stock our hand with creature to power up our Lotleth Troll. There are many other ways to build a deck around Evolutionary Leap. One of the other ideas I had was a mono-green deck - to ensure we always have green mana open - and to abuse cards like Strangleroot Geist, Kitchen Finks and Eternal Witness. 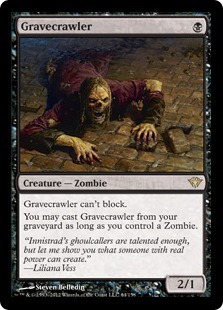 I like using Undying creatures which turns sacrificing your creatures into an advantage, I particularly like Strangleroot Geist as it can be sacrificed and still attack immediately. Eternal Witness helps buy things back from the graveyard which is very useful. 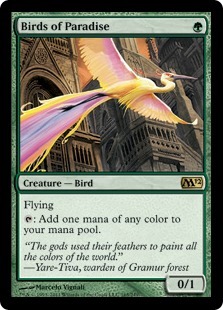 I also thought Nykthos, Shrine to Nyx could give us a nice mana boost and give us mana to cast our creatures in hand. My main problem with a list like this is that it felt like a poor man's Genesis Wave deck. It just doesn't have the same punch at the top end. However, it's still an idea that could be taken further. I had some fun messing around with Evolutionary Leap in Modern. Having played around with it a bit more I think my first impressions of it were correct and it just isn't quite powerful enough for Modern. There are certainly a number of ways in which you can get value out of the card but the lack of tutoring really hurts the card. It's also quite a mana hungry card if you want to be casting your creatures and keeping up Leap mana to go with it. I still don't think I've found the best way to build around Evolutionary Leap but it's always fun to experiment. If you have any fun ideas or decklists for Evolutionary Leap or any of the other new cards then I would love to hear about it. That's all for this week. I'm planning on covering more Magic Origins cards and would appreciate your input. I am quite busy this month so I'm not entirely sure if I'm going to release articles as consistently as I would like. However, I will try my best to keep the content coming. I've just started a twitter account for my Magic exploits so please follow me @mtgomodernman. Those are some good ideas. I did think about token creation so we can sacrifice them for real creatures. I didn't think about it much further. The only problem with running Young Pyromancer and Monastery Mentor is finding the right balance between running enough to activate them and enough creatures/token generators to make playing Leap worthwhile. 2 dragonlord dromoka + 4 monastery mentor is probably sufficient for leap since leap only wants one creature at a time and you put the rest of the cards revealed on the bottom of your library. With some tweaking and upgrading of cards I am sure this would be OK in Modern. Great? Probably not but OK and fun. Id probably relegate the hallowed moonlightx2 to the sideboard, and replace the sword with an actual sword like F&F or F&I. Astral Cornucupia would become Lotus Bloom, Blossoming Sands obviously would be Temple Garden, End Hostilities would be Wrath or the like.